“The Trouble with Tribbles.” By David Gerrold. Perf. William Shatner, Leonard Nimoy, DeForest Kelley, and James Doohan. Dir. Joseph Pevney. Star Trek. Season 2, episode 15. NBC. 29 December 1967. DVD. Paramount, 2008. Shatner, William. “Hamlet / It Was A Very Good Year.” The Transformed Man. Decca, 1968. I nearly forgot Captain Kirk's famous version of the "To be or not to be" soliloquy from Hamlet. All right, so it didn't happen exactly that way. 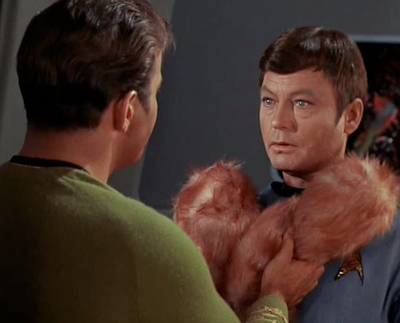 I've taken the audio from Shatner's 1968 album that combined the classics of literature with modern song lyrics—all in the inimitable style of William Shatner—and grafted it to the "Trouble with Tribbles" episode. It actually works, in a weird, wild, wonderful way. I love this Shatner/Shakespeare link...he's very projectable character, if you know what I mean. I can even see him doing Eleanor of Aquitaine in this quote from her famous speech from Lion in Winter. Didn't he say just that in "The Gamesters of Triskelion"?